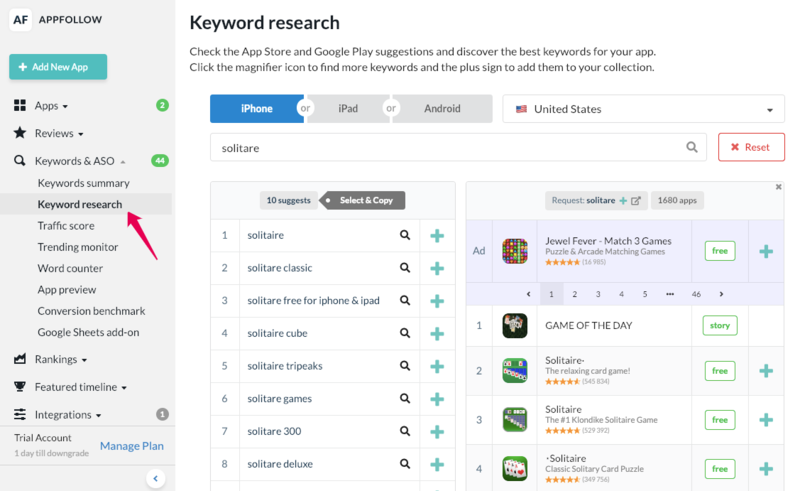 AppFollow Keyword research tool simulates users search in the app stores. This is how you get to know what your users are looking for, and their interests to improve your keywords and ASO strategy in general. It supports suggests in App Store and Google Play, iPhone, iPad and Android and all countries that both stores support. Use Keyword research to get the most out off keyword research and set up the best fit for your ASO marketing strategy. On the left will be 10 related suggests for App Store and up to 5 for Google Play. Click on a keyword to see the list of apps that use this keywords or relevant apps. Your favorite apps will always be displayed on the top. It doesn’t mean that the app uses the keyword. App stores show relevant apps depending on keywords. On the top of apps that use a suggested keywords or relevant ones you will see the list of apps that use Search Ads. The number of ads will differ from a keyword to keyword. Say, 47 apps promote via a search request “solitaire”, this means that it would be hard and expensive to use it for ads. However, only 12 apps promote via “solitaire cube” — here you will have less competitors and lower bids. What apps will be displayed depend on their bids and ad campaign settings. On the right will be 100 App Store and 49 Google Play apps. This is what user see once they have searched for a “solitaire” request. Click an app to see all other keywords this app is using. The keywords will be ranged depending on their Traffic score (74 is a popular word, 5 is the least popular one). Apart from apps from search request, you will also see the App of the Days cards, if there’s any, app bundles and in-app purchases. This feature is available in App Store only. If you click on a Google Play app, you will be redirected to an app page in the app store. You can add both suggested keywords and apps to your tracking. Just click on green green plus button.